Voted the "Best Outdoor Theater" in New York City by 'L' Magazine, over even the Public Theater in Central Park, the Hudson Warehouse was founded in 2004 by Nicholas Martin-Smith with the intention of delivering the most vibrant, relevant, and engaging outdoor theatre possible. The first season consisted of a single modest production of The Tempest which performed over two weeks in July. Our summer season of classical theater has now expanded to three shows produced over the summer months of June, July, and August. Hudson Warehouse was a 2013 recipient of Goddard Riverside's "Good Neighbor Award" in recognition of its "extraordinary deeds in helping build a better community." In September of 2013, Hudson Warehouse was invited to become the Resident Theater Company of Goddard Riverside's Bernie Wohl Arts Center. With a winter home, the Warehouse now has a five show, year-round season which also includes both its 'Shakespeare in the Bar' and 'Writers-a-Go-Go' contemporary play reading series. In addition to the company's full season, we teach workshops of the classics to high school students, bring our productions into schools and colleges, offer our unique 'Hudson Warehouse Shakespeare Workout,' and teach a play writing class to 4th and 5th graders as part of the Goddard Riverside After School Program. 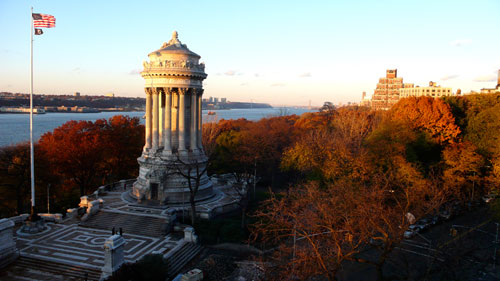 Our summer home is the Solders' and Sailors' Monument located along the Hudson River in the heart of Riverside Park. It offers a beautiful back-drop and the north patio lends itself to a natural three-quarter thrust stage much like the one used by the actors at the original Globe Theater. At the core of the Warehouse is a community of artists committed to presenting the classics in quality productions, made accessible to not only the Upper West Side and the five boroughs of the City of New York, but to people from as far away as New Zealand, and Taiwan, Rotterdam and Jerusalem who make this unique theatre experience a destination point during their visit to the city. We are only able to continue to provide such wonderful, memorable productions and lasting community work through the donations of our friends, supporters and our generous audiences. There are several perks which we can offer you for your donations which we encourage you to discover. Click on our PERKS page to see all the great items you get with your donation! We hope you will choose to support us today and celebrate our continued work in improving the quality of life on the Upper West Side.